NMath from CenterSpace Software is a .NET class library that provides general vector and matrix classes, complex number classes, numerical integration and differentiation methods, minimization and root finding classes, along with correlation, convolution, and best of class vector random number generators ideal for high performance Monte Carlo simulations. The NMath Core namespace contains a complete framework for generating, streaming, and selecting sets of vector random numbers which supports a large set of distributions. Additionally, NMath has classes for both Sobel and Niederreiter quasirandom number generators, standard methods for uniformly filling n-space with random numbers. This functionality can be used from any .NET language including VB.NET or F#. Complete documentation for all NMath libraries is available online. 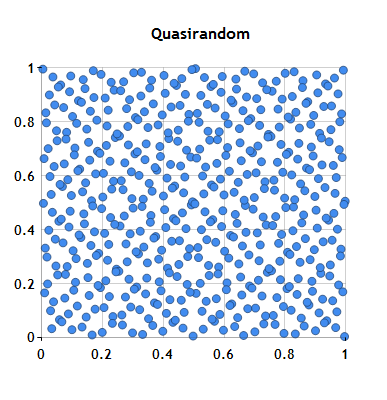 For general background on the Random Number class library, see the Random Number Generators chapter in the NMath Users's Guide. The CenterSpace blog has articles on some aspects of using random number generators with NMath along with code examples. API documentation for the random number classes is available in the NMath Reference Guide, outlined in the table below. Note that all random number classes are also available in the analogous single precision form. Compute only with the precision needed as the single precision random number classes can be more that twice as fast as the double precision classes. Possion distribution with varying mean. Integer values with uniform bit distribution.